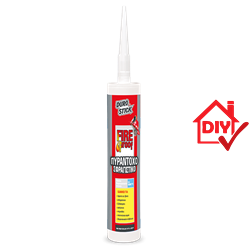 Fireproof sealant and joint adhesive. It does not crack under extreme temperature variations, and it firmly adheres to porous or else surfaces, fire (refractory) bricks and natural stone, concrete as well as cast iron, steel, brass and copper, etc. Easy to work with, both on horizontal and vertical joints, without sagging. Ideal for sealing, without priming, detached and weathered joints in fireplaces, stoves and barbeques. Also suitable for chimneys and steam pipes, industrial ovens and wood stoves . It does not contain asbestos.